There are dishes that can no longer be thought away from his life. Courts that have shaped us in childhood and just one of them. For me it is very clear pasta. All my life, there was every evening as a first course pasta. For those of you see the now somewhat puzzled: Yes, there at my parents' dinner of several courses, which is common in most Italian families (in our region). even if the hunger was not so large, prefer the meat and not the pasta dish was omitted. 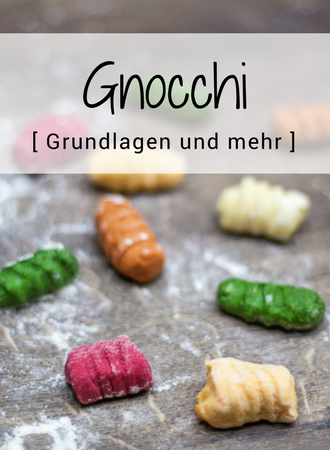 Everyday Pasta, is not it boring in the long run? No way, because pasta is so versatile! Even if you often use the same type of pasta, one can a month serve with the sauce certainly every day a different dish. Especially when buying pasta the quality of the sauce is critical and for me the real star on the plate. 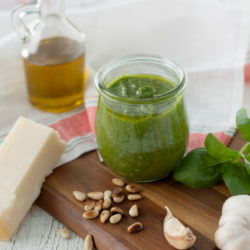 This is exactly why it is called in May on Sundays on the blog: “Italian Kitchen – Learn all about CLASSIC pasta sauces!”, Today It starts with a classic, especially when time is of essence is the perfect solution: Pesto! There are now so many types of pesto, which many do not realize what is underneath really understands. Generally one can say that it is a cold sauce that (by the crushing of the products it. “beat”) Arises. If you want to stay with the traditional Pesti, then the “Genoese Pesto” the classic. This basil plays the leading role and gives the sauce the typical green color. Also well known is the “Red pesto”, A variant of Sicily with dried tomatoes and almonds instead of pine nuts. The great thing about this pasta sauce is not only the quick preparation, but also the fact that you can vary the ingredients according to taste and season, and thus created a new variant. Wild garlic pesto, arugula pesto, pumpkin seed pesto, beetroot pesto,… , The list could continue ad infinitum, you raging Just some and experimenting around! What must be considered in the preparation? Die Kräuter sollten vor der Benutzung auf jeden Fall trocken sein. Entweder werden diese ganz leicht mit einem Tuch abgewischt oder erst gewaschen und dann auf einem Tuch abtropfen gelassen. Wovon man auf jeden Fall absehen sollte ist das Trockenschleudern, da durch die Umdrehungen einzelne Zellen zerstört werden könnten und dadurch schon ätherische Öle, die für den Geschmack benötigt werden, verloren gehen. Reference should use a mortar in the production, which is like to fall back in the present day to a blender. By the variant with the mortar to reach the full development of aromas and felt less bitterness. Is not the question for you, then I would advise you not to use the mixer in continuous operation, but only with short and quick “pulsations” to work. Very important is the rapid processing of the ingredients. Let ye too long the crushing of basil or other herbs, this oxidized in air. By reaction with the oxygen, the color changes, making your product then no longer green beautiful but is rather brown. You want a perfect pesto? Then you should save in any case with the products! Because this pasta sauce is made very few ingredients, the quality is the essential! Pay attention to use high-quality olive oil, which is rather mild in flavor. This should be the flavors of other ingredients, for example, do not overlap by a strong bitter note. In the cheese I recommend to buy these at a time and then rub just before use. Sure it does a pre-grated cheese as well, but the flavors unfold in the moment of friction, so that they are no longer so strongly present in the already grated variant. 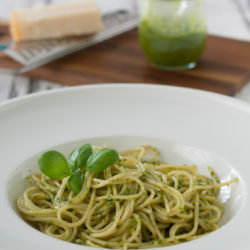 The versatility in the use of Pesto is often underestimated and it is then usually only used as a sauce for spaghetti and co. but this fits perfectly with meat, fish or on (toasted) bread. If you're looking for a tasty side dish for barbecues, I can feel you Pesto Savarin recommend. Who is very brave, can for example Dessert serve a mint pesto, making a special note is created. Die wohl gängigste Art Pesto aufzubewahren ist dieses in ein Glas abzufüllen, mit einer Ölschicht zu bedecken und im Kühlschrank zu lagern. 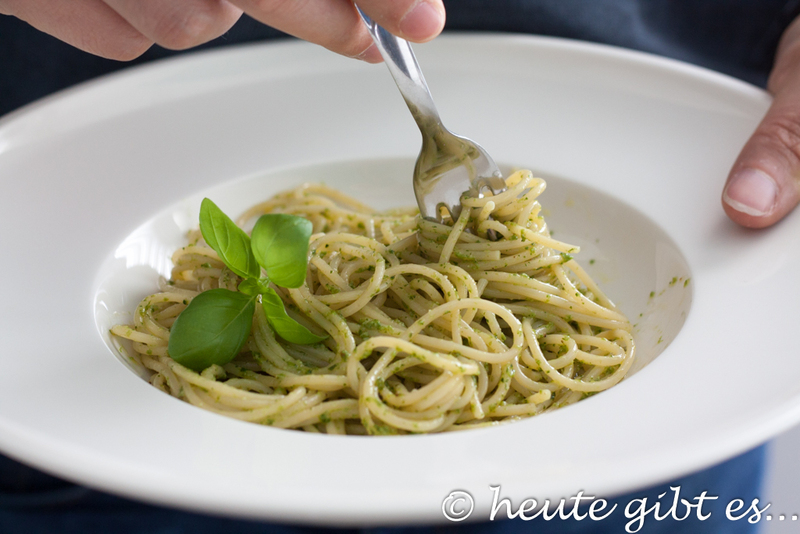 Nach jeder Verwendung muss man hierbei einfach den Pesto wieder glatt streichen und falls nötig noch etwas Öl hinzugeben. Durch die Ölschicht verhindert ihr sowohl die Reaktion mit dem Luftsauerstoff, als auch den Verlust von Aromen. 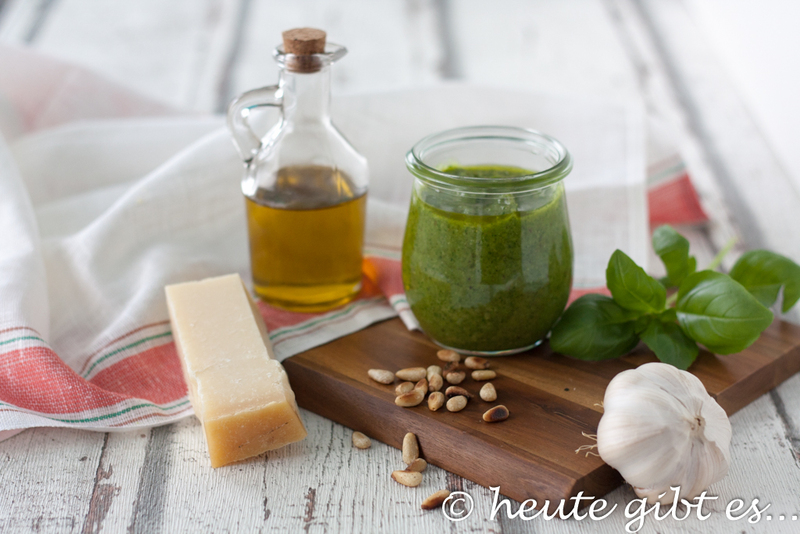 Mit dieser Methode sollte der Pesto jedoch nicht länger als 2 Wochen gelagert werden. Alternativ für eine längere Haltbarmachung kann er auch eingefroren werden. Ganz geschickt ist hierbei die Verwendung einer Eiswürfelform. Dabei einfach geeignete Mengen in die entsprechenden Mulden füllen, einfrieren und falls gewünscht anschließend die Würfel aus der Form nehmen und in einem gemeinsamen Behälter einfrieren. When using the frozen pesto cubes this thaw in no case in the microwave or in a double boiler. It is enough if you take the pesto portion required from the freezer just before the boiling of water. Are the noodles even should the Seven necessarily absorb little of the cooking water. In a saucepan, then first give the pesto cubes and a little cooking water and then the pasta and mix well. Regulates the boiling water to the desired consistency. Toast the pine nuts golden brown in a frying pan. with short and rapid pulsations Puree all ingredients in a blender or food processor. Alternatively, you can also use a mortar. Then this best meet the following ingredients sequence: garlic, basil, pine nuts, cheese, oil. can best pull the pesto after manufacture about 20 minutes and then keep (see tips above “storage”). 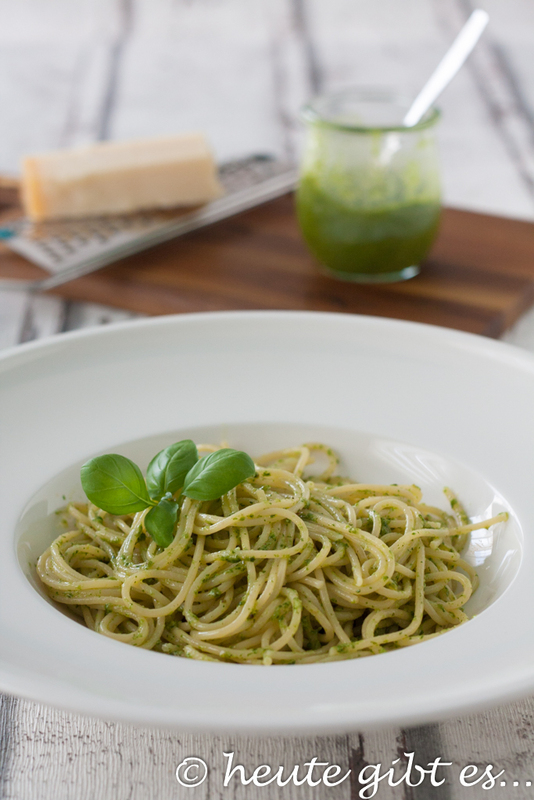 If you want to use the pesto right, you can watch the “dormancy” used for the preparation of noodles. Use absolutely high quality products, as they are responsible for flavor. Process the ingredients quickly so that the herbs do not oxidize and your pesto then do not turn brown. 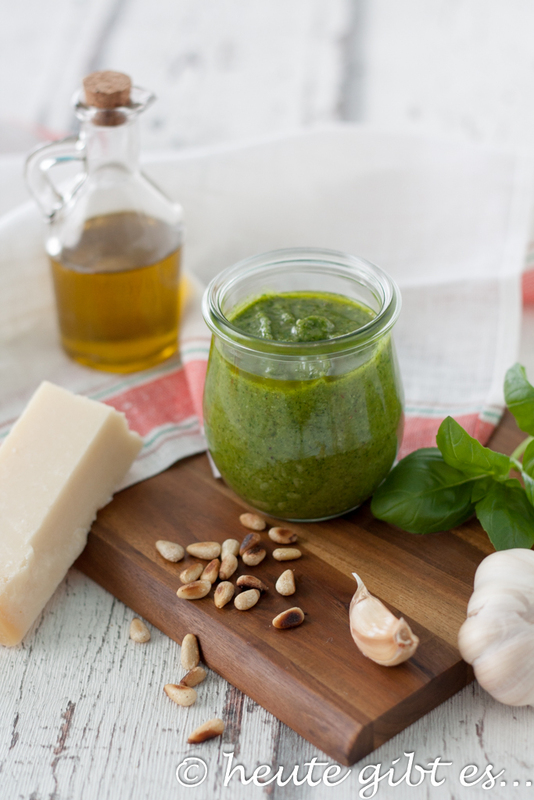 Ensure that you have in storage in the refrigerator your pesto is covered with a layer of oil. Have you ever made yourself pesto? What flavor is your favorite? I'm curious! 2 Kommentare zu "Pesto genovese – and tips for a perfect pesto"
I find Pesto also an ingenious invention!